As lovely as rare and exotic botanicals are for natural skin care use, common herbs are too! There is so much magic and effectiveness right outside your doorstep. Each herb has a host of benefits, and in this article I will focus on herbs wild or naturalized in the northeastern United States. Black Raspberry and Blackberry are both marvelous astringents and toners. Use the leaves of each for their high calcium and vitamin C content. When used as a vinegar-based skin toner, these healing components are imparted to the skin as well. 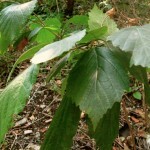 To use make a tincture in witch hazel or apple cider vinegar. I prefer to dilute this with a floral water, like rosewater or basil hydrosol to make it less drying. Elder flowers are calming, reparative, and contribute to healing the skin from damage associated with too much sun, trauma, and pollution. They are also a soothing wash for the eyes when made into a tea. Use in astringents, toners, skin creams and skin care oils. 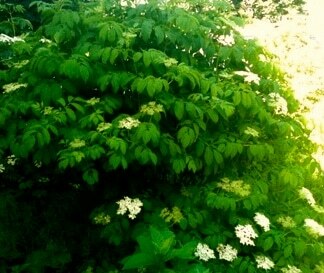 Elder is a splendid small tree and grows rather easily. In a project that I co-founded, we planted a food forest on vacant city lots and included 5 elderberries in the design. They are growing wonderfully and we get a ton of flowers every year. After only 3 years the trees are about 10 feet tall. Spruce is highly antimicrobial and bracing, as are other evergreens. 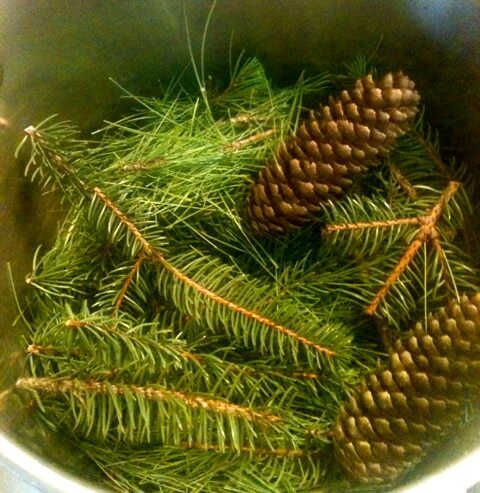 The needles are high in vitamin C. Spruce needles can be made into toners and healing balms. They have properties beneficial for natural anti-acne formulas, for large pores and oily skin and in men’s skin care. I find evergreens, and tree medicine in general, to be very grounding, comforting and strengthening. I tend towards a seasonal use of spruce and other evergreens, working with them in the cold months as syrups, body oils and balms. Plantain is a favorite of mine for its drawing properties. Very useful for pulling out bee stings, splinters and even lumps and bumps when used fresh as a poultice. It also has emollient and moistening properties as a base in balms, herbal oils and natural skin care creams. 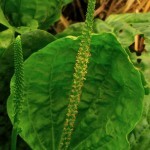 Plantain is also a good choice in anti-aging and dry skin formulas. While working in the garden, I’ve learned that cleavers, when dead, has very prickly hairs that splinter the skin and sting too. Since they are so small, it’s nearly impossible to remove them. 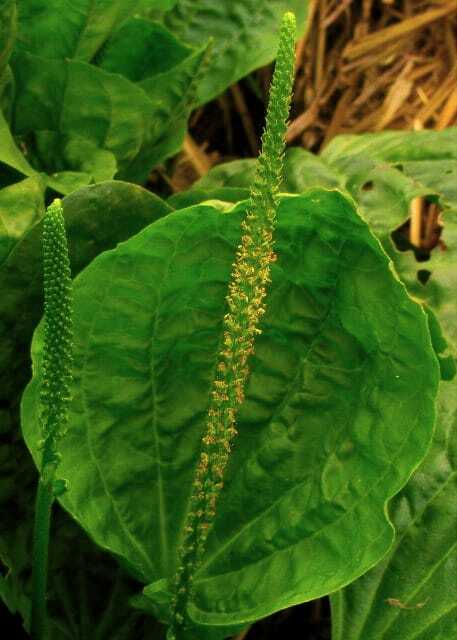 A bandage of chewed up plantain leaves, wrapped with burdock leaf and tied together with a grapevine works very well to ease the pain and redness of the skin and pull out the little needle-like hairs. Dandelion flower is a beautifier and a bright and sunny smile on a spring day. 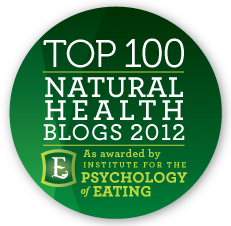 Often regarded as a nuisance, dandelion is a potent herbal medicine. I use this herb from flower to root, for all sorts of medicinal preparations, from a bold roasted root tea to an olive oil based body oil. Herbal skin care applications include infused oil, in balms and skin care creams. Dandelion flowers are suitable for a range of conditions from large pores, age spots, sunburn and chapped skin. An infusion or tea made from the flowers can be used as a wash for a beautifying treatment and the leftover flowers can be made into a poultice. The milky sap of the stem reminds me of glue and is used to curb growths such as warts. Burdock seed and root (Arctium lappa) is another of our weedy friends. 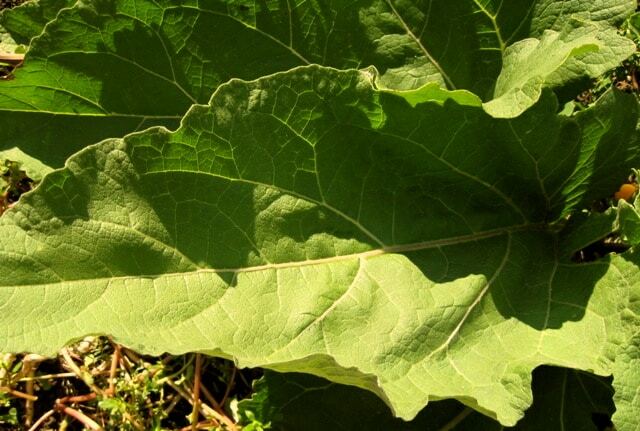 Growing up, we always called it “elephant ears” because the leaves are huge and wrinkled like an elephant. The root is highly regarded for healing acne, as a detoxifier, drawing out impurities and dirt and it has slight anti-microbial properties. 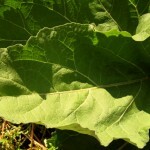 Burdock seed is specific for healing eczema and dry, flaky, crusty scalp (like cradle cap). As an oil, it makes a lustrous hair and skin smoother. 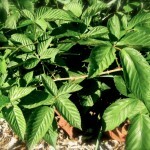 Both the seed and root can be used as a fresh wash, poultice and made into a vinegar-based toner. Burdock root can be tricky to dry. Recently I had a batch of freshly dug, washed, and cut roots grow moldy drying in a large paper bag. Though I was shaking the bag often, the moisture content of the root is high and I did not properly manage the humidity. What would I do differently next time? Wash the roots less vigorously, dry them with a towel after washing them and invite air and circulation into the drying environment. Witch hazel and Oak barks both have anti-microbial and toning properties. Be sure to harvest carefully as trees need their barks mostly intact. 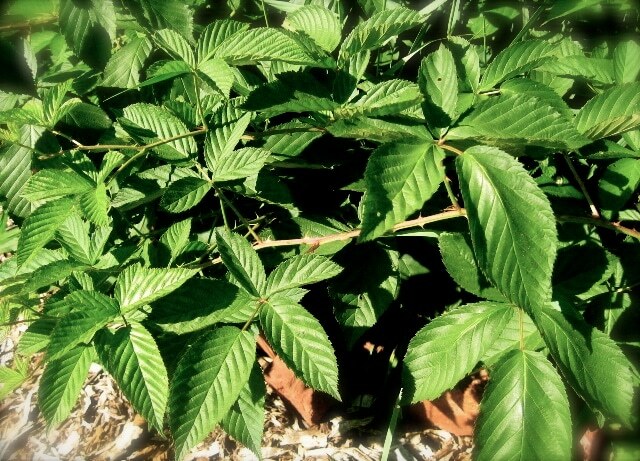 Both of these barks are astringent yet soothing, useful for conditions such as acne, poison ivy, and anytime an antiseptic is needed. Using the barks as a decoction will ensure that the tannins are kept intact. I love to use high-quality witch hazel extract as a base for toners and astringents, which I then infuse with other skin-loving herbs. The alcohol content of the extract is generally 14%, which is a low alcohol content for preservation; however, infusing dried herbs has always given me great results and I’ve never any problems with going it off. 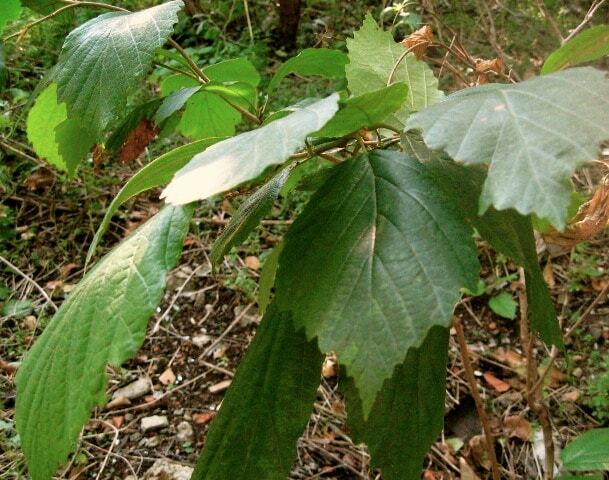 As with berry leaves, witch hazel and oak barks are lovely when cut with floral waters to moderate the astringency. Violet is highly emollient, juicy, and mucilaginous. 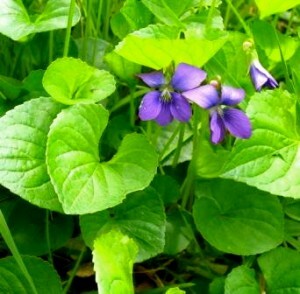 Sweet with a touch of astringency, violet leaves and flowers are useful in healing balms, for dry skin care, and to assist in healing wounds, scars, lumps, and bumps. Violet is beneficial as an herbal oil or cream, or used fresh as a poultice. Violet is also a highly regarded anti-inflammatory, and is useful to help resolve fibrocystic breasts and mastitis. 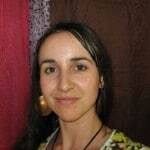 If you are interested in learning more, there is a whole section dedicated to herbal skin care on my website. I am also really excited to be developing a materia medica specifically for skin care uses of herbs. 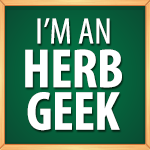 What are your favorite herbs for skin care and how do you use them? Michelle Czolba dedicates her life to connecting with the Earth, spiritual growth, and creativity. She creates natural skin care products with the wild flair and passion of the green Earth and shares her knowledge on her website and blog Wildly Natural Skin Care. I purchased some bottles of ‘Violet Floral Oil,’ after reading in one particular write-up on-line that it heals burns. Now, since then I have repeatedly seen stated such things that claim or suggest that ‘Violet Floral Oil’ does not exist, with reaons as to why given. Maybe what is meant is that one cannot extract oil from the flowers, but can only infuse such as a carrier oil with the flower extract. Whatever the reason for anyone insisting that ‘Violet Floral Oil’ does not exist, I see that claim as purposely mis-leading, and deceptive, to viewers. Because the bottles of ‘Violet Floral Oil’ that I purchased were very inexpensive, and I want to assure you that the one rare write-up that claims it HEALS burns was, and is, ABSOLUTELY CORRECT!!!!!!!!!!!! I could not care LESS how the ‘oil’ was made into true ‘Violet Floral’ OIL, it not only smells like the sweet soft baby-poweder scent of Violets, but TWICE I burned my arm on a red-hot burning burner, and instantly remembered I had Violet Floral Oil, and put some on the burn. The intense pain was gone within less than 10 minutes, and felt like it was never burned at all, and did not blister, nor scar. I truly believe that it is BECAUSE it actually WORKS wonders that herbalists that KNOW it does are made afraid by certain organizations to CLAIM that it does. If that is not the reason why no Herbalist except one in the midst of hundreds of sites, bothers to state the truth about it, or are not aware of it. I just wanted you to know that it truly works like a miracle on burns, and I don’t mean just MILD burns.